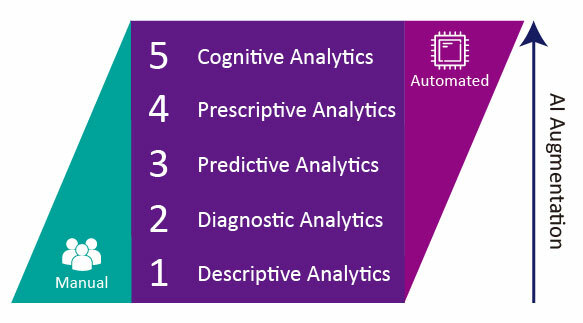 As shown in the figure below, AI has evolved from descriptive analytics (gathering data and data visualisation) to the cognitive analytics (automated analytics which makes things happen). AI is the simulation of human intelligence processes by machines, which are able to learn and solve problems on their own. The ultimate goals of business analytics are to help business increase revenue, improve operational efficiency and other measures of performance by analysing data. How can AI and analytics help your business? AI and analytics can help enterprise reduce costs, increase productivity and generate more revenue. Recent advances make it economically viable to apply them to your business. AI technology mimics routine and systematic human behaviour. It can carry out repetitive tasks more cost-effectively than humans. Enterprises are adopting AI-powered solution like chatbots and virtual assistants to lower operating costs. They free up labour, allowing staff to focus on higher value activities. AI can perform complex tasks at unparalleled speeds and accuracy. A Japanese insurance company increased productivity by 30% after replacing 34 insurance claim workers with AI*. Powered by the sophisticated analytic capabilities of AI, massive amounts of business data can be processed and analysed. Enterprises can use this to gain a more comprehensive understanding of their business, devise new strategies and develop a new generation of products. ClusterTech has over 16 years of experience and more than 190 professional staff. Most have advanced degrees in science & engineering. We are trusted and recognised by clients in the APAC region.